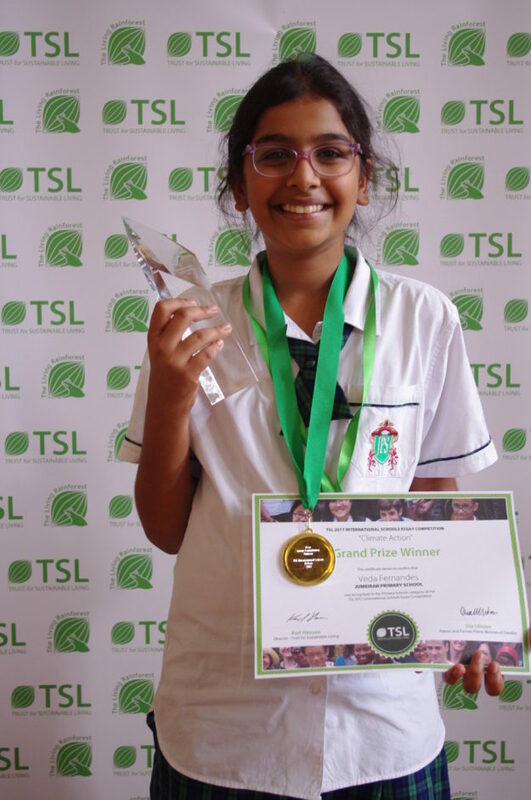 The Trust for Sustainable Living (TSL), based in the United Kingdom, is pleased to announce the Grand Prize winner and runners-up in the TSL 2017 International Schools Essay Competition on Climate Action. TSL received over 1,200 essays from 77 countries. Veda Fernandes (11) collected the 2017 Grand Prize. In her essay, Veda imagined she was a doctor treating planet Earth for a case of ‘Clima-changeitis’. Veda Fernandes (Jumeirah Primary School, UAE). The awardees received their prizes at the TSL 2017 International Schools Awards at Rhodes House, Oxford (3-6 July, 2017). TSL will send a special copy of the Top 5 essays in each category to the new Secretary-General of the United Nations, Manuel Guterres.